A choice among competitive carriers is important to the attractiveness of the port of Wilmington to shippers. Infrastructure improvements at the port of Wilmington have led to the growth in the container trades. NC Ports Cold Chain Summit discussed new investments to position Wilmington among cold chain players. Infrastructure improvements at the port of Wilmington, North Carolina, has helped with its efficiency and turn times, prompting more container lines to express interest in calling the port. 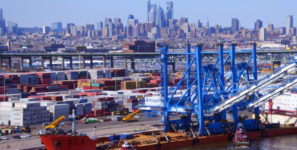 But the port’s lack of congestion is perhaps its most attractive feature, as Wilmington is currently operating at 50 percent of its container capacity. Infrastructure improvements at the port have led to the growth in the container trades and newer investments are positioning Wilmington to take its place among cold chain players. These were some of the topics discussed at the NC Ports Cold Chain Summit 2017, held in Wilmington earlier this month. The increasing presence of major container carriers at the port is heartening to Joel Coleman, general manager and vice president for international sales at Butterball, the second largest producer of turkey products in the country, who said that a choice among competitive carriers is important to the attractiveness of the port. Butterball generally leaves the choice of ports and carriers to its customers, but Coleman said he talks up the port and its storage facilities and lets it be known that the company would like to be shipping out of Wilmington. Two years ago, 4,500 TEU was the capacity of largest vessels that called on the Port of Wilmington. By late 2016, the port had handled an 8,500 TEU ship. With the recent expansion of its turning basin, the port can handle 10,000-TEU vessels and is looking to expand beyond that, according to Brian Clark, the port’s chief operating officer, who also spoke at the summit. The recent completion of the turning basin expansion has helped ready the port for the newer generation of neopanamax vessels that are making their way to east coast ports from Asia thanks to the expansion of the Panama Canal. Berth improvements currently underway in Wilmington will see close to $200 million poured into a project that will allow the port to simultaneously work two large vessels. Larger cranes are now on order to complete the port’s big-ship capabilities. On the drawing boards is an update to the container terminal itself. Mediterranean Shipping Company (MSC) and Maersk Line are among the carriers that have enhanced their services to the port in recent months, and just within the last couple of weeks Crowley announced it will start calling Wilmington beginning at the end of November. That service—with a rotation that includes Honduras, Guatemala, and Cuba—has, according to Hans Bean, vice president of trade and development at N.C. Ports, significant cold chain potential for produce from Central America and proteins exported from North Carolina. Announced at the summit is that Chesterfield, a real-estate developer based in Jacksonville, Florida, will be building 400,000 square feet of Class A industrial warehouse space in two buildings at the port of Wilmington. Several ports in the southeastern United States have joined the Department of Agriculture’s cold treatment program in the last couple of years, which allows some South American produce to come southern ports instead of being moved through northeast for the cold treatment and clearance that eliminates the threat of disease and pests in the fruit. Wilmington will be joining that program beginning December 1, according to Bean.